Anderson Cooper, I also saw what you saw. 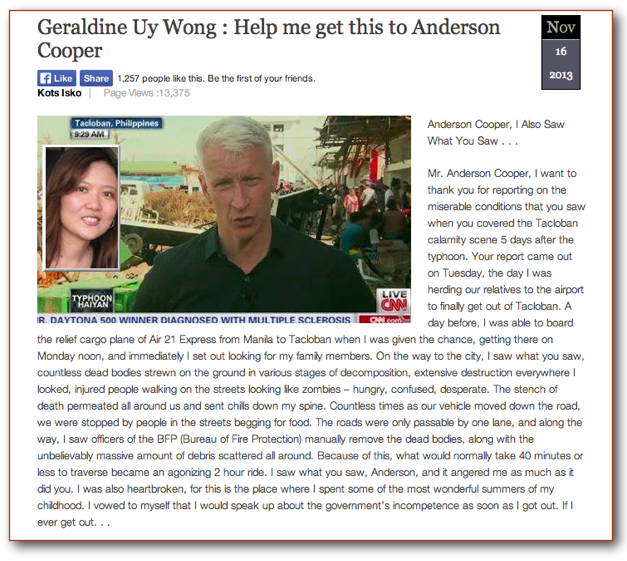 Mr. Anderson Cooper, I want to thank you for reporting on the miserable conditions that you saw when you covered the Tacloban calamity scene five days after the typhoon. Your report came out on Tuesday, the same day that I was herding our relatives to finally get out of Tacloban. A day before, I was able to board the relief plane of Air 21 Express from Manila to Tacloban when I was given the chance, getting there at Monday noon, and I immediately set out looking for family members. On my way to the city, I saw what you saw, countless dead bodies strewn on the ground in various stages of decomposition, extensive destruction everywhere …..
Hey, that’s poulefwr. Thanks for the news.